The 1961 photo taken in Queen Mary St School I am fifth from the left second row, my mother had put rollers in my almost waist length hair the night before and had to cut them out before I went to school hence the “electric shock” look to my hair. Sorry can’t remember the teachers name but I do remember she was very nice. The boy fourth from the left in the back row is Willie Miller the football player/manager. I lived in Queen Mary Street at this time so getting to school was a short walk across the road. My grandparents owned McAusland’s the newsagents shop in London Rd Bridgeton for many years, the shop closed 1967 due to the redevelopment of the area, we then moved to Ayrshire where I still live; hope these snaps bring back memories for other pupils. 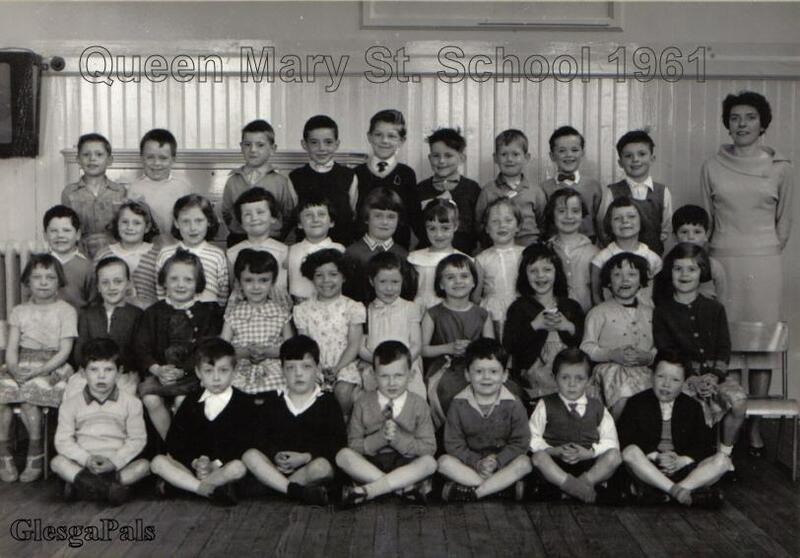 Dear Webmaister Hi there I have just been looking at your site after being told about it by my brother and lo and behold I found a class picture with me in it Queen Mary street school 1961 3rd row 3rd from the left keep up the good work thanks Morag. Hi webmaister, my cousin Nancy Graham is in the Queen Mary primary school 1961 class photo, 2nd row number one , and I am in the Bernard st school pic of 1963, second row number 2. It's great to see these as I dont have any pics of that time, keep up the great work , you make our past real. Hi, Just came across your brilliant site and I (Lindsay Smith) am sitting cross-legged in position No. 4 front row on the 1961 class photo taken in Queen Mary Street, Primary. Awright Webmaister,looking thru your B.B. site and then schools I came across this school photo Queen mary St. 1961,to give you some more names to your photo. My younger brother is in this photo. He is Alex Marshall,back row no7. also back row no. 4 is Willie Miller ( Aberdeen and Scotland football fame ) and I think the lassie 2nd row no 4 her surname is MacFadyen not sure of the spelling. I too attended this school 1959 to 1961 and then went to dalmarnock primary 1961-1962 and then to John St Primary 1962 to 1965. My brother and I were both in life boys at 219 B.B. john st Primary and I then went to 219 B.B. Company at john st pimary. I have a school photo of when I was at Queen Mary st, but don't know how to put it on computer.it is in a cardboard frame, about 1960 I think. can you help. Our grand mother was Maggie MacLaren who had the wee shop at 77/79 Bernard Street, Mrs Walker had the sweetie shop on Queen mary st, opposite the primary school, I was baptised in Queen Mary St Church of Scotland, St Francis in the East, and if memory serves me right my maw amd paw were married in this church in 1953. My maw;s name is Cathie MacLaren, she had two older brothers Richard and Robert, and two older sisters,Maizie and Margaet.Granpaws name was Robert.